The menu “File” contains all the commands you need to open, save, and print your files. “New” will open a normal, blank Papyrus text document. The option “New (from template),” will open a new file selection window, in which you can select a template to use from your Template Folder. Here you can choose either a new text from a template or a whole new project. If you choose a new project, all the documents belonging to a project will be created for you. “Open…” will open a File Selection window, in which you can choose the file you would like to open. This does not necessarily have to be a Papyrus Word Document (“*.PAP”), but can also be a Word, a Word Perfect, an RTF, a ASCII, or an HTML document. If the document you open uses a font that you have not yet installed in Papyrus, the dialog “Choose Replacement Font” will open. “Open other…” → “Show Folder with this Document” will do exactly that and will show you were you have saved the document you currently have open. In the “Open Other” menu you can also open a new Database, or one you have previously created. “Open other…” → “New Document with Current Layout” will open a new document, but instead of using the standard layout from “_NEW.pap,” it will use exactly the same layout found in the current text. “Open other…” → “New Document with Standard Pages Layout” will use the document »_norm.pap« as a template for your new document. This allows you to start working in standard pages immediately. “Open other…” → “Edit Template/Form” allows you to edit a form or a template as you wish. “Open other…” → “Edit Template for New Documents”: Here you can change or edit the template document “_NEW.pap,” which serves as a blank slate for new documents. 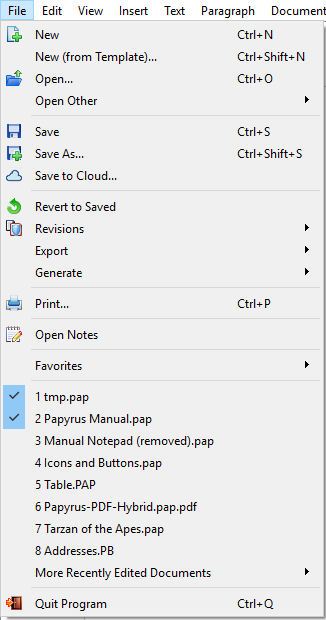 And lastly, in this menu you can choose to show the folder where Papyrus itself has been installed or choose to see where the Papyrus Preferences are located. Back to the main menu: “Save” will save the changes in your current document to your hard drive. You can also use the icon in the toolbar to save. “Save as…” saves your document under a new name, which you can select in the file selection window. 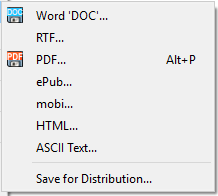 Here you can also choose which type of file you would like to save it as, for example a MS Word document, or in HTML. The icon in the toolbar contains the same function. “Revert to Saved” will delete all changes since the last time you saved and overwrites the document with the last version on your hard drive. Another way to find earlier versions of your text is in “Document Backups,” where older versions of your text are available. “Backups” will turn on the backups for this document, or, if backups have already been turned on, will show the last version of your document with the revision number and time, which you can then choose to open. If you open an older version of your current text, the current one will not be affected. The older version will simply open in a new window. When you choose “Save for Distribution” you can decide which internal elements of your document (such as comments, etc.) you don’t want to appear in the publication. The sub-menu “Generate” → “Transform to Classic Standard Pages” will take your document and turn it into the standard pages used by publishers. Margins, lines, and number of characters will be set to the publishing standard. In this sub-menu you also have the option to choose between “real” standard pages in “Courier,” or standard pages in “Times,” which are easier to read. “Generate” → “Adopt Styles from Other Document” will assign the layout from a template to your current document (works like transforming your document to standard pages). 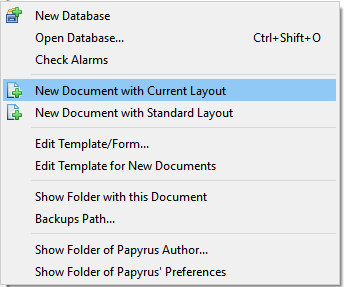 You can choose any Papyrus document as the template for your layout. Papyrus will then take the page layout and text formatting and apply them to your current document. The “Presentation Mode” will show your current document in a presentation (Papyrus will adjust automatically according to your screen resolution). You can either start a presentation at the beginning of the document or from the current page. Under “Generate” there is also an option to “Check Links.” This allows you to go through the entire document and check that all links, integrated pictures, and hyperlinked documents are correctly linked. “Print…” will open the “Print” dialog, in which you can print your current document. “Notes…” will open Papyrus’s Notepad, which is an easy way to save your ideas on the fly. “Document Sets…” allows you to choose a group of documents (under “Preferences,” “Document Sets”) that you would like to open together; you can also close other documents if you wish. This option in the “File” menu will only show up when there are sets to open. If you have not created any sets yet, you will not see this option here. You can label your document as a “Favorite” in the “File” menu. “Favorites” are documents you would like to access often. “Recently Edited Documents” can also be found here. If your current document contains other “Associated Documents,” these will also show up in favorites. To close Papyrus, choose “Quit Papyrus”. If you have unsaved changes, Papyrus will ask whether you would like to save before quitting the program.